Settle for ‘okay’ or wait for the perfect mate? Settling for “okay” may be a better strategy than waiting for Mr. or Ms. Perfect—at least from an evolutionary point of view. 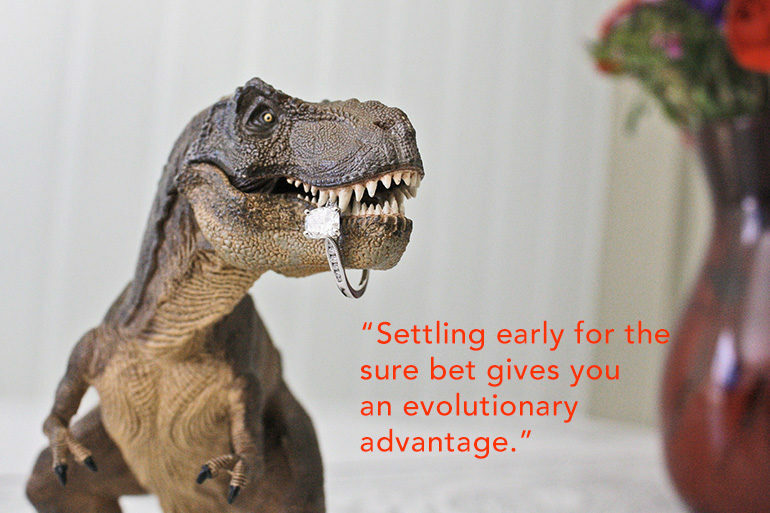 When studying the evolution of risk aversion, Michigan State University researchers found that it is in our nature—traced back to the earliest humans—to take the safe bet when stakes are high, such as whether or not we will mate. “Primitive humans were likely forced to bet on whether or not they could find a better mate,” says Chris Adami, professor of microbiology and molecular genetics and co-author of the paper. Adami and his co-author Arend Hintze, a research associate, used a computational model to trace risk-taking behaviors through thousands of generations of evolution with digital organisms. These organisms were programmed to make bets in high-payoff gambles, which reflect the life-altering decisions that natural organisms must make, as for example choosing a mate. Adami and his team tested many variables that influence risk-taking behavior and concluded that certain conditions influence our decision-making process. The decision must be a rare, once-in-a-lifetime event and also have a high payoff for the individual’s future—such as the odds of producing offspring. How risk averse we are correlates to the size of the group in which we were raised. If reared in a small group—fewer than 150 people—we tend to be much more risk averse than those who were part of a larger community. “We found that it is really the group size, not the total population size, which matters in the evolution of risk aversion,” Hintze says.